With Diablo III having been released just last year, we take a look at the first game in the series that started it all. Diablo is an action RPG game that has a dark theme that has been released on PC and the Playstation. We look at the Playstation release. 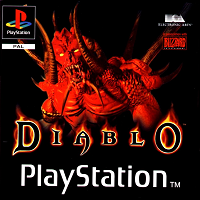 Diablo was released to the Playstation in 1998. It is one of the more famous titles ever released by Blizzard. To some, this is a staple game to have played if you’ve lived through the 90’s. You start off with selecting what kind of adventurer you are. Your choice is either warrior, sorcerer or rogue. Each kind of character has their strengths and weaknesses. After you’ve made your choice, you find yourself in the village of Tristram. You meat a bar tender, a drunk, a blacksmith, a healer, a witch and a wise man. You then start off your quest in the dungeon inside the cathedral. If you’re a warrior (haven’t played as the other characters), you’ll comment, “The sanctity of this place has been fouled!”. From there, you’ll begin exploring the dungeon, killing monsters, completing quests, and gathering treasure. One of the interesting elements of this game is the fact that most of the dungeon is randomly generated. So, each player will get to have their own experience when playing this game. Another aspect of this game is that your character isn’t the only thing that can take damage. Your armor and weapons can gradually wear down after a while and can be repaired by the blacksmith in town. Another great element is the fact that as you get further and further into the dungeon, various entrances appear in Tristram to help reduce redundant amounts of traveling. This is quite a plus, although my preferred mode of transportation is the teleportation. Spells can be learned through spell books and higher levels of each spell can be learned as you gather more spell books. In addition, the items you collect in the dungeon can change in quality. So, if you have found two of the same kinds of weapons, the attributes can vary slightly. The game isn’t exactly perfect. As you travel throughout the dungeon, you can gather enough items to fill the amount of empty slots you have. A potion can take up one slot while a hammer can take up six slots. This might seem like a novel and unique way of handling inventory, but this can also get quite annoying because sometimes, you’ll find a weapon and your character will complain he can’t carry it. When you look in your inventory, you’ll realize that, technically, your character can, indeed, carry that weapon, but the way the items are laid out, you don’t have a nice square or rectangle of squares. So you have to rearrange your items so you get a neat square to fit that weapon that’s sitting on the dungeon floor. This seems like an unecessary task when what could really be done is have items auto arranged to allow the maximum number of items in your inventory. So, while a novel concept, the item system is more troublesome than interesting. Another downfall of this game is that if your character has a certain amount of gold, the money can start to eat up valuable inventory space. Each space can carry a maximum of 5000 gold coins before the gold spills over into the next item box. When you get to the end of the game and can carry around 30,000+ gold, this can get tiring after a while. While realistic in its own right, it’s also an annoying attribute of this game – especially considering there’s no place to store everything. A third thing that wasn’t the greatest in the world about this game is the attribute system of weapons and armor. Sometimes, you’ll get a weapon that can damage something just a little more than another, but the weapon you have contains a number of attributes that can make it just as attractive. Sometimes, a weapon can deal a certain amount of damage, then have the attribute of +50% damage. Why not just show the real amount of damage it can do? This can lead to some unnecessary confusion and difficulty in deciding on what to keep and what to sell. The loading bars also slowed down gameplay. Want to enter the next level? Loading. Want to go back a level? Loading. Want to warp back to town? Loading. The loading screens, while varied, just hampered the gameplay in the end. The graphics of this game are fairly well done. This is not talking about the cinematics which is just 3D rendered out scenes. In my view, that doesn’t count because it’s not really a part of the actual gameplay. The music is also well done. You get the familiar theme of Tristram every time you enter town. You’ll also get some very well done ambient music in each part of the dungeon which ads to the dark ambiance of the game. Generally, this game is quite well known for being one of THE games to play in the RPG world. In my view, is it absolutely amazing and the best game ever? Not exactly. Is it a bad game? No. Is it a good game? Sure!